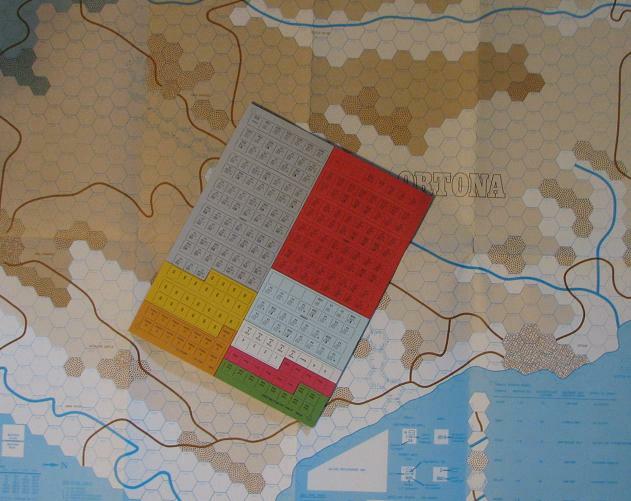 Ortona: The Advance through Italy, Dec. 1943 was a hex and counter wargame designed by Stephen Newberg and released by Simulations Canada in 1983. As the title suggests, the game is an historical simulation of the fighting around Ortona, specifically an operational level game. "In December 1943 the Allied advance up Italy was stalling. To regain momentum on the Eastern flank the 1st Canadian Division was given the task of capturing the strategically important city of Ortona. Resistance was expected to be light. However torrential rain turned the countryside into a quagmire and the Allied artillery maps proved inaccurate. The Germans had dug in along the length of a gully outside Ortona and were reinforced by the elite 1st Parachute Division. The battle for the gully lasted 10 days with Germans fighting for every inch of ground and inflicting severe casualties before falling back to Ortona. Once again the Germans dug in." "Ortona is an operational game of the Allied drive on the city of Ortona in December 1943. The Allied player must attack two heavily fortified positions manned by excellent troops. The German player must conserve his small force, and time retreats and counterattacks with skill." Scale: Turns are 1 day long, units are company sized, and each hex is 170 metres across. Ortona is a forgotten gem from the Simulations Canada stable. As in SimCan�s previous, highly successful Dieppe, this one deals with the exploits of the Canadian Army ... Game play reflects quite well with published works on the battle. The Canadians launch the 2nd Brigade into the teeth of The Gully position at the game�s onset, and get themselves well and thoroughly battered. That rarity, a SimCan design from someone other than Steve Newberg! I was able to mail order my new copy from a Canadian game dealer a few months ago and understand that it may still be available new from Clash of Arms Games for less than $10 in ziploc when bought in quantity with other SimCan games. Rob Citino, Comsimworld, quoted in Simulacrum, Issue 10, Jan 2001. Jim Di Crocco III, Simulacrum, Ibid.